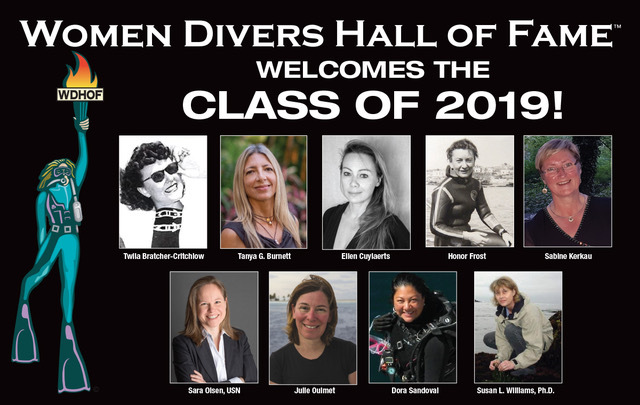 The Women Divers Hall of Fame has announced the 2019 class. The majority of the alumni hail from the USA. The six new members are from the USA, Belgium, Canada and Germany. 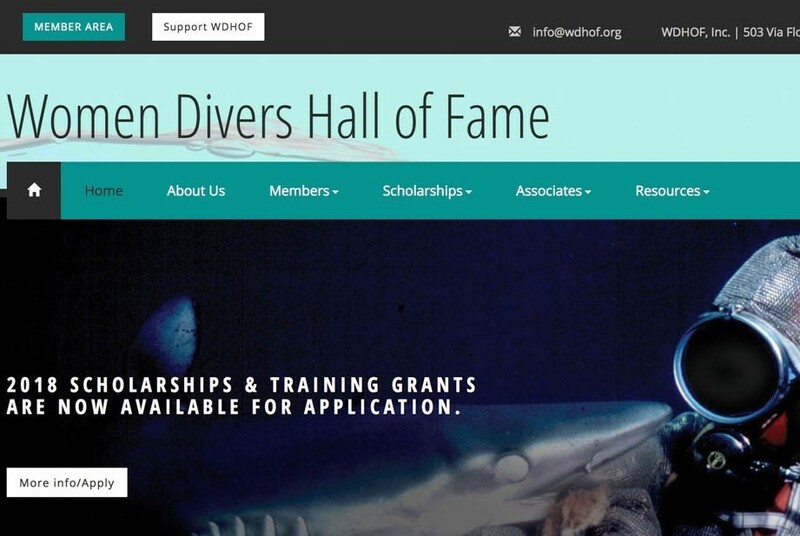 They will be inducted into WHDOF at Beneath the Sea in March 2019. Twila Bratcher was a diving pioneer and adventurer, and learned diving from Conrad Limbaugh 1951 and E.R. Cross 1953. Cross wrote, “Twila was the prize student of my first class,” calling her a “National Treasure.” She formed Sea Nymphs, women-only dive/spearfishing club, was an underwater television show actress, underwater photographer, pilot, and Platinum Pro 5000 Diver. Bratcher’s Living Terebras of the World is the definitive book on terebra shells. She described 35 species, authored 73 papers on malacological topics, with four species named for her. She dived the world for her fieldwork, visiting museums, studying, identifying, and gifting shell paratypes. Twila endowed Scripps Institute of Oceanography, The LACM of Natural History, and San Diego Wildlife Park. Tanya earned a BA in Diving Industry Sport Management from Barry University and owned one of Florida’s first technical dive training/retail facilities. She holds recreational and technical instructor ratings from PADI, NAUI, TDI, and SDI. She was a co-founder of TDI, and was a sales executive for Uwatec and Dräger Rebreathers. She is a professional underwater photographer and writer, having authored and/or produced images for over 100 published articles in dive and travel magazines. She has organized and led dive expeditions globally for over two decades. Tanya is closely involved with marine conservation groups in South Florida and the Bahamas. Ellen Cuylaerts is an international, award-winning underwater photographer, ocean advocate and visionary. Ellen was inducted into the Ocean Arts Society, and accepted as a Fellow International in the Explorers Club where she serves as a member of the Flag & Honors Committee. In June 2017, Ellen addressed heads of state on World Oceans Day at the General Assembly of the United Nations, highlighting the plight of photographers and filmmakers engaging in protection of the oceans. She curates the United Nations World Oceans Day Photo Competition. Ellen loves cold diving in arctic conditions and the darkness and silence of cave diving. Honor Frost was a scholar, explorer, author, and underwater archaeologist. An early pioneer in the field of underwater archaeology, she was a consummate archaeological illustrator. As early as 1959, she pioneered recording methods and photography on submerged shipwreck and harbor sites. Her work inspired and facilitated the broader scholarly study of these resources and she was an advocate for the protection of underwater cultural heritage. She left her inherited art collection to endow the Honor Frost Foundation. The Foundation’s mission is to promote the advancement and research, including publication, of maritime archaeology with an emphasis on Lebanon, Syria and Cyprus. In 2005, the British Sub Aqua Club (BSA awarded her the Colin McLeod award for "furthering international co-operation in diving for her work in archaeology." Sabine Kerkau is a technical wreck and mine diver, writer and photographer. She has dived on several hundred wrecks down to 125m, and has identified many new wrecks. She has been on expeditions to the HMHS Britannic and the HMS Victoria in Lebanon. She was an expedition member of the MINEQUEST 2 project in Newfoundland and was part of the founding team of the “Baltic Sea Heritage Rescue Project” in Lithuania, which is committed to ghost net salvage, and wreck search, identification, and protection. She reports on her projects at international conferences, for several television productions, and in the magazines, Wetnotes, Divemaster, Unterwasserwelt.De, Unterwasser, XRay Magazine, and Tauchen. preparation of an experimental hull, and mission leader for underwater searches in Louisiana intercoastal waterways. Sara transitioned to the Reserves where she commanded three units, and served in multiple staffs. She co-founded a non-profit to bring inclusionary sport and fitness, including diving, to people with disabilities. Julie is an expedition videographer, filmmaker and professional diver. She is a Fellow of the Explorers Club, an Associate Member of the Boston Sea Rovers, and a Member of the Ocean Artists Society. She has twice been awarded and has carried the Explorers Club Flag, and has co-led and organized two scientific missions that contributed to the creation of a Marine Protected Area. Julie is a Trimix diver, a PADI Assistant Instructor, DAN Instructor, and the past owner of a PADI 5-Star IDC that won three North American awards. She is an active ocean conservationist, seasoned speaker, contributor to dive publications, co-author of a book, and is the co-founder of an International Underwater Film Festival. conservation of marine biodiversity. Dora is the founder of “Héroes del Mar” which teaches children from coastal communities of Baja the importance of our oceans by working together to respect, conserve, and solve the problems we face today. Dr Susan Williams was an American marine biologist and Distinguished Professor of Evolution and Ecology at the University of California, Davis, where she directed the Bodega Marine Laboratory from 2000-2010. She researched and utilized her scuba skills in many marine coastal ecosystems (in particular seagrass, seaweed, and coral reef habitats) and how they are affected by human activities. She was a strong advocate for environmental protection, and was credited with helping pass legislation expanding the boundaries of Northern California’s Gulf of the Farallones and Cordell Bank national sanctuaries, increasing the area of federally-protected coastal waters.